Dark Souls II: Right next to the first and only bonfire. Dark Souls II: Scholar of the First Sin: Found in the building to the left after the first set of stairs. From the McDuff's Workshop bonfire up the stairs to the tower straight ahead, or from The Tower Apart bonfire the tower across the broken pathway. She leans against a wall in the tower. Dark Souls II: At the Lower Earthen Peak bonfire. Dark Souls II: Scholar of the First Sin: Found before the Covetous Demon fight. From Harvest Valley, enter Earthen Peak via the lower route, go through the room of poison urns, and follow the passage to the right. You will find her in the room on the right, opposite a Pharros' contraption. The most hidden of her locations. From the first bonfire in Black Gulch stick close to the edge. Before the first tar pools you can spot a small ledge below. Using a torch is strongly advised to see it. Drop down and follow the path to find her leaning against a wall. Dark Souls II: Next to the shortcut gate in the area. At the bottom of the elevator. Next to the hidden, second bonfire. Just before the Smelter Demon fog gate. Just after the bonfire, up the stairs. Can be summoned for five various boss fights. If her storyline is completed, she will gift you her equipment: Lucatiel's Set and the Mirrah Greatsword. Alternatively, you can purchase her armor and sword from Merchant Hag Melentia if you kill her. Talk to her at every location and exhaust all her dialogue. Summon her for at least three boss fights and have her survive the boss fights. NOTE: You can re-battle the same boss multiple times by use of a Bonfire Ascetic. For example, you could have her fight Flexile Sentry twice and then the Rotten once and that would count as three wins needed for her to give you the equipment. Lucatiel can be encountered in No-Mans's Wharf, the Lost Bastille, Earthen Peak, and the Black Gulch. She can be encountered in any location in any order and her dialogue progression will remain the same. The second time she is spoken to, she rewards the player with a Human Effigy. The third time she is spoken to, she gives the player a Ring of Steel Protection +1. She can be summoned for the Flexile Sentry boss fight in No-Mans's Wharf to fulfill the boss fight requirements. You can find her sign next to the shortcut gate (Dark Souls II) or at the beginning of the dock leading to the boss ship (Scholar of the First Sin). If you've spoken to her at the Lost Bastille, she can be summoned before the fight with the Lost Sinner at the bottom of the lift in Sinners Rise before the sewer area with the exploding undead. Speaking to her at Earthen Peak allows her to be summoned to assist you in the fight with the Smelter Demon in the Iron Keep. Speaking to her at the Black Gulch allows her to be summoned for the fight against the Rotten. She then moves to her last location in the foregarden of Aldia's Keep. If you look closely enough you'll see she has removed her mask and part of her face has turned hollow. If the above requirements are met, she will give you her equipment. If not, kill her and you will be able to purchase her equipment from Melentia. If you talk to her before completing the above requirements she will disappear and you will lose your opportunity to complete her quest for that playthrough. Her brother invades once you go up the steps into Aldia's Keep. She will remove her mask (you will see the animation of her removing the mask ) the second time you meet her, but you must NOT skip when she said "Assuming, of course, that the legends are true. _" , if done correctly, she will remove the mask when she says her next line. As it's in the same area, Lucatiel can be summoned and brought to the Old Iron King boss fight. However, she's near useless in said fight and it will not count towards her questline, assuming she can even make it to the fight without falling to her death on the way there. Occasionally when summoned for a boss fight she will not enter the fog wall into the boss arena. This seems to happen most often in the Old Iron Keep where she will get stuck outside the door frame. Her pathing is also notably spotty, and she will often fall to her death in Sinners Rise and the Old Iron Keep without any outside assistance. I don't know you, and you don't know me. Things are better that way. Heh heh. You are an odd one. From the land of Mirrah, to the far east. across the mountains. 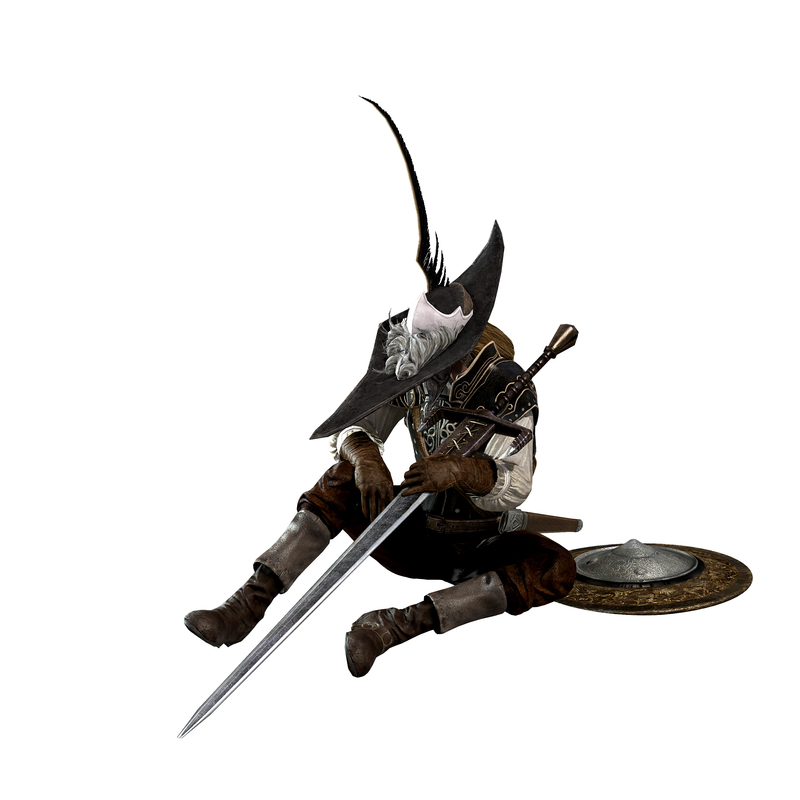 They say Drangleic brims with powerful souls. And so I came to claim my share. But what a strange place…Even the rumours did not prepare me. You are an odd one, indeed. I've always made a point of avoiding people. While you've made a point of engaging me. I can see that you are mid-journey. If you require assistance, I will help you. I come from Mirrah, a land of knights. My sword is always ready. I thought that might be you. You haven't changed a bit, have you? Heh heh. The longer I am here, the more madness I discover. A wretched place, indeed, but not without traces of its former glory. What could have caused such degradation? Ah, yes, I have not thanked you for humouring me the other day. Of course, I've no idea what it is. Heh heh. Our land of Mirrah is surrounded by enemies, and constantly at war. There is only one way up in Mirrah. Join the Order, and prove yourself in battle. …with two things. My sword, and my loyalty to my Lord. I was raised to wield a sword from birth. Life was hard, but I never gave it a second thought. I had swift success on the battlefield, and quickly attained respectable stature. Have you heard of the Undead? These poor souls affected by the curse. An Undead gradually loses his humanity, until his wits degrade completely. Finally, he turns Hollow, and preys upon others. And a Hollow can never be human again. One can skirt this wicked fate only with the help of the souls found here. Assuming, of course, that the legends are true. I can only hope…that they are. I'm sorry…to burden you with talk of my fate. I suppose I've grown weary these days. Still on the road, are you? Sorry to have burdened you so. This is for you, by way of an apology. I've found my thoughts growing hazy. My memories are fading, oldest first. The curse is doing its work upon me. I had an older brother. We learned to fence together. He became the most decorated swordsman in all of Mirrah. I never even compared to him. In fact, I never beat him, not once. But then, one day…he was gone, lost without a trace. Now I'm certain. That he was taken, by the curse. My brother must have come here, too. The question rings in my mind, but I haven't the focus to answer it. Loss frightens me no end. Loss of memory, loss of self. Then I would draw my sword without hesitation. I don't want to die, I want to exist. I would sacrifice anything, anything at all for this. It shames me, but it is the truth. Sometimes, I feel obsessed… with this insignificant thing called "self". But even so, I am compelled to preserve it. Am I wrong to feel so? Surely you'd do the same, in my shoes? Oh…No, forgive me… I know you…Yes, of course. But I pray for your safety. I beg of you, remember my name. That will be quite enough! If this is your wish, so be it. I won't die in this foul place!